As my regular Freeview box is away for servicing I needed a cheapo replacement to use in the meantime and settled on this Goodmans GDR11. The box is aimed squarely at the budget end of the market but includes some features which are hard to find even on higher priced models. Available at many places for around £25 I got mine from Play.com for £20 including shipping. First off the box is extremely easy to install. For those living in areas served by two transmitters it lets you choose which area's programmes to watch. During initial install the box asks which type of TV you're using, 4:3 ratio or 16:9. It then lets you choose how you want the picture to be formatted to fit your TV. The box is very good at distinguishing between widescreen and 4:3 programmes and adjusting the picture accordingly. I mention this as a previous budget-priced box I owned forced me to either switch picture ratio manually or suffer a distorted picture. Mercifully the power supply is built-in so there is no silly mains plug adapter required. The remote handset is ergonomically designed with clearly labelled and well spaced-out buttons. A minor quibble is that there is no backlight to help finding buttons in the dark. The basic controls are duplicated on the front of the set top box so there is no need to panic if you misplace the remote handset. This is a feature which I dearly wish other manufacturers would include. The manual and quick start guides are written in large print so you won't need reading glasses even in poor light. In practice the only thing I needed to read were the instructions for programming the remote handset to work with my TV as well as the Freeview box. If for some reason you wish to change it back so that the remote handset works only with the Freeview box or with a different make of TV it is very easy to do. For the hard of hearing there is a subtitles button and for some programmes even an Audio Descriptive service for the visually impaired. The front of the box has easily-seen buttons for all the main functions plus a headphone socket. On the back of the box there are two Scart sockets, one for TV and one for video recorder. A Scart lead is supplied with the box and and Scart output can be switched between RGB and composite colour. There's no S-video socket and no option to output S-video via the Scart lead. There's also no digital audio socket of any kind. This is probably just as well as the sound suffers from occasional audio stutter. Either I'm unusually sensitive to this or else I have a poor sample. On the other hand lip-synch is always good. 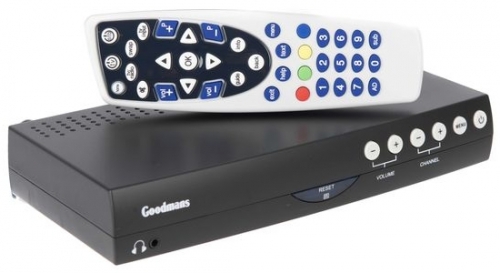 Unusual now for a box in any price range the Goodmans can connect directly to an older TV via the aerial socket, a suitable lead is provided for the purpose. The modulated output can be set to any channel in the UHF range. As supplied I found the audio level too loud for my ancient portable TV when connected this way but the level can be turned up or down via the remote handset. As far as I know this particular feature is unique to Goodmans, I don't know of any other brand with a modulated RF output which has it. Basic performance of the Freeview box is probably adequate for its target market but not suitable for the more technically minded. There is for example no HDMI socket for newer flat screens and the second Scart socket cannot pass-though an RGB or S-video signal from another device. The only separate audio output is a headphone socket mounted conveniently on the front panel. It is theoretically possible to add stereo sound to an old mono TV by connecting a pair of self powered speakers to the headphone socket although I haven't tried it yet. While being very easy to read, the on-screen guide can only display the programmes from one channel, there is no grid to compare what is on different channels at the same time. There is also no timer function so a TV channel would have to be left running continuously for a recording to be made. For anyone who plans to timeshift recordings I would recommend a Freeview+ box with built-in recorder in any case. EDIT: I've since learned that Goodmans make such a box themselves. This box is now retired from the living room to use with an old bedroom portable TV and indoor aerial. Reception is surprisingly good even with a weak signal but the biggest advantage is that the box has now added remote control of channel selection and audio level to a TV which previously didn't have either, and all for just twenty quid! Cannot receive DVB-T2 channels whether HD or SD.